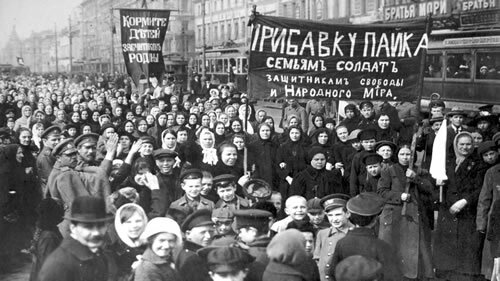 The Russian Revolution began on International Women's Day, 1917, which serendipitously coincided with the festival of Purim. Tens of thousands of women joined striking workers to call for an end to Tsarist autocracy. Over the course of eight months in 1917 Russia underwent rapid change, moving from a Tsarist autocracy to a republic ruled by a Provisional Government, then rushing headlong into full scale communist revolution and crippling civil war. For the Jewish population of Russia these upheavals were especially disruptive. At first it seemed that a new era ofUltimately, the revolution would drive Jewish religious life entirely underground civil and religious liberty might emerge. But ultimately the revolution would drive Jewish religious life and culture entirely underground. Throughout the revolutionary period, its leadup and its aftermath, Rabbi Shalom DovBer Schneersohn—known in Chabad as the Rebbe Rashab—worked tirelessly to mobilize the Jewish community, strengthen its infrastructure, and ensure that its most basic religious needs were provided for. A wealth of documentary evidence reveals his keen awareness of the significance of the unfolding events, and of the opportunities and pitfalls that the end of the autocracy might bring. The decisive days of February and October 1917 found him in Petrograd and Moscow respectively. Even as the revolution unfolded in the streets around him he remained undistracted and resolute, always asking himself: what can I do today for the perpetuation of Jewish life, learning and practice? Back in 1910 the Rebbe Rashab had stood up to the Tsarist regime when they sought to secularize Jewish education. In a meeting with Pyotr Stolypin at the time, the soon to be assassinated Minister of the Interior dubbed the Rebbe “Schneersohn the revolutionary.”1 The communists, in contrast, would later brand all associated with the Schneersohn name (the “Schneersohnovschina”) as counter-revolutionaries.2 As we shall see, the Rebbe was constantly alive to the changing political conditions. But in the face of tyranny and upheaval alike, the future of Judaism always remained his foremost concern. By the summer of 1914, political and social unrest had been brewing in the Russian Empire for decades. Now Europe, and indeed the entire world, was on the brink of war, and the situation seemed more unstable than ever. Austria-Hungary, backed by the assurance of German support, declared war on Serbia at the end of July. The Tsar responded by mobilizing the Russian army in defense of Serbia, and when the Tsar refused to stand down Germany declared war on Russia. 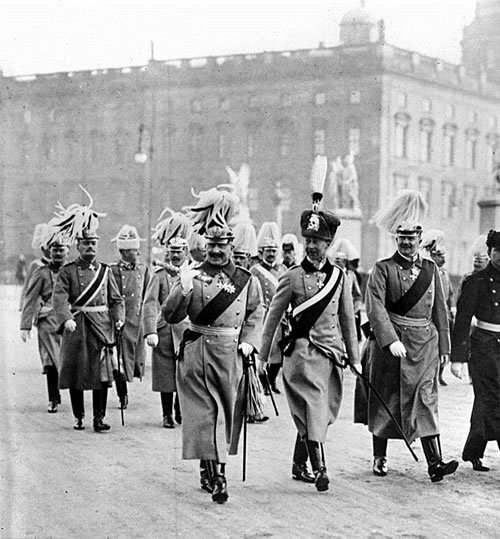 Kaiser Wilhelm II of Germany with his son, Crown Prince Wilhelm (in busby) beside him, parading in Berlin, January 1st, 1900. On the following Tuesday, Rabbi Yosef Yitzchak accompanied his father on one of their customary walks. By now all of Europe was at war, and the Rebbe Rashab mused on how the rapid pace of world events would touch the lives of so many individuals in ways both terrible and miraculous. He alsoAll of Europe was at war mused on the nature of the strong nationalist spirit that seemed to transcend the material resources or military capabilities of each nation, and which seemed to be most powerfully felt not by the populace, but by the leaders and monarchs.6 Above all he mused about the future, expressing a sense that Russia was facing an existential threat akin to the one faced just over a century before with Napoleon’s invasion of 1812. In this context, the Rebbe Rashab recalled that at every moment the famed Rabbi Levi Yitzchak of Berdichev anticipated the onset of the messianic age, the ultimate redemption that Jews have awaited for two thousand years. But at the time of Napoleon’s invasion, Rabbi Schneur Zalman of Liadi, the founder of Chabad, “knew with clarity that the time had not yet come,” and argued instead that Russia’s success would ensure the spiritual welfare of the Jewish people. 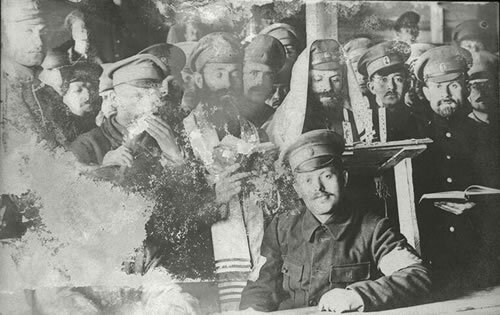 Jewish soldiers of the Russian army. Courtesy of the Leo Baeck Institute, New York. Tsar Nicholas II of Russia (right) speaking with his first cousin Grand Duke Nicholas Nikolaevich, commander in chief of the Russian armies (left), in November 1914. In the face of the double threat of the German advance and the Russian retreat, the Rebbe Rashab resolved to leave Lubavitch. His grandfather and great-grandfather had first settled in the town following the war of 1812, and for just over a century it had been the home of fourThe tumult of war and unrest was just the beginning successive Chabad rebbes. This was not just a physical home for the Rebbe, but a place steeped in the holy spirit of Chasidism. It was here that his ancestors were buried and it was here that he had built the great Tomchei Temimim Yeshivah. Initially it was hoped that the move from Lubavitch would only be a temporary one. But in truth the tumult of war and unrest was only just beginning, and the spirit of revolution was already in the air. 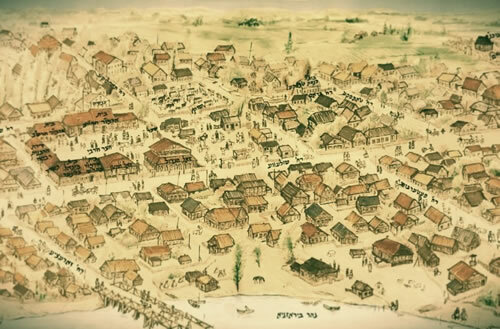 The city of Lubavitch, home to the Rebbes of Chabad from 1813 to 1915. The Rebbe’s courtyard is depicted on the left. 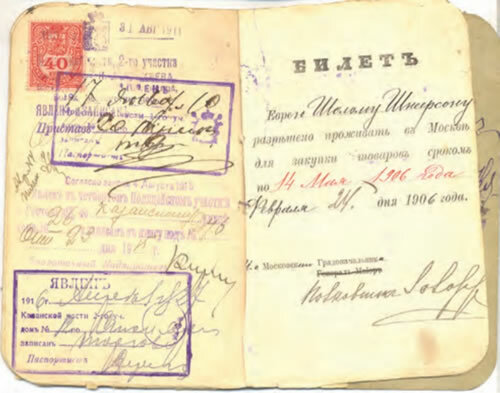 A page from the Rebbe Rashab’s internal passport, as published in Me-beit Ha-genazim, 22. Corresponding to the gap in extant correspondence is a gap in transcribed Chassidic discourses. The last discourse before he traveled to Petrograd was delivered on Shabbat Parshat Va’airah. These discourses, as a rule, do not explicitly address current affairs, restricting themselves to explaining kabbalistic concepts and their application in the service of G‑d. But in this case the allusions are hard to overlook. Commenting on the verse “See! I have made you a lord over Pharaoh,” he discussed the power given by G‑d to Moses to bring about Pharaoh’s downfall. The souls of the righteous, he explained, are from the realm of tikkun (order and repair). The souls of the evil, on the other hand, are from the realm tohu (unchecked chaos), which resulted from the cosmic shattering of divine singularity. Paradoxically, tohu carries greater divine potency than tikkun, but without order and repair it is tragically perverted. It is generally theResentment against the Tsar was growing, but few imagined he would be forced to abdicate role of the righteous person to help the evil person through a process of repair, identifying their good points, or finding a way to extract some good results from their chaotic activity. Only once the good that tohu harbors has been extracted can the downfall of evil be brought about. Without this process of repair the evil person remains at the height of their unconstrained power, and the righteous cannot bring about their downfall. Pharaoh remained impervious to all attempts at repair, and so Moses was powerless against him. Only the transcendent power inherent in G‑d’s essential infinitude could bring about emancipation and exodus for the enslaved people of Israel. While resentment against the Tsar was building few imagined that he would soon be forced to abdicate. The practical change that most envisaged was more along the lines of constitutional monarchy. Considering the events that would unfold over the next few weeks, this teaching on the downfall of a despotic monarch at the height of his powers seems presciently significant. 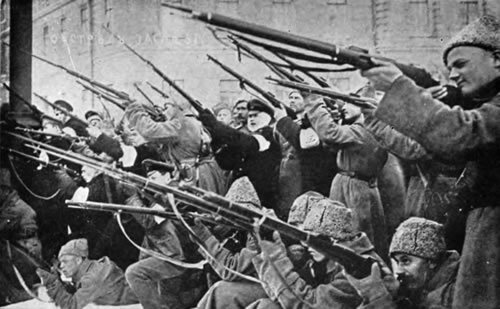 Revolutionaries take up arms against Tsarist police during the early days of the February Revolution in Petrograd. Many years later Rabbi Yosef Yitzchak recalled that he too had been together with his father in Petrograd during the revolution, and that they traveled back to Rostov accompanied by Eliyahu Chaim Althaus. “At one of the stations Reb Eliyahu Chaim bought a newspaper with the latest reports. When my father read that the Tsar had been overthrown and that the country had become a free land he said, ‘now we must establish branches of the Tomchei Temimim yeshiva in all towns and villages. Now that secularism is spreading we must make many schools and yeshivot. In all times and in all matters victory is determined by the power of mesirut nefesh alone.’”27 Mesirut nefesh translates literally as “soul dedication” but signifies the willingness to offer your very life for the perpetuation of Judaism. This term is traditionally associated with oppression, anti-Semitism and martyrdom. But the Rebbe understood that the civil freedoms of a new secular state would pose just as great a challenge to the Torah way of life, which could only be overcome with even deeper levels of selflessness and commitment. Under such circumstances a rigorous foundation of Torah education would be the only guarantor of a Jewish future. The Provisional Government of the Russian Republic, March 1917. Corresponding personally with leading rabbis across Russia, and especially with Rabbi Chaim Ozer Grodzinski of Vilna, the Rebbe Rashab began developing a vision for a united religious front that could gain a majority in the National Jewish Congress. The congress would be a democratically elected body, empowered by the new government of Russia with a degree of autonomy over Jewish affairs. The Rebbe understood that with religious freedom came the civic responsibility of political organization and engagement. To sit with arms folded would be to allow Zionists and Secularists to displace the traditional Torah way of life, learning and practice, and to reshape the Jewish community and its public institutions in their own image. 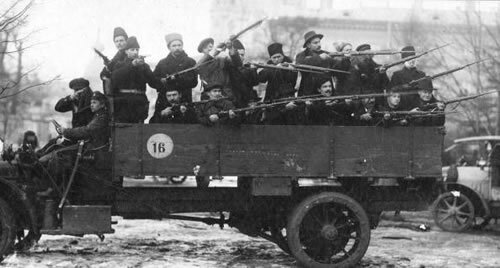 Armed Red Guards on a truck in Petrograd, October 1917. 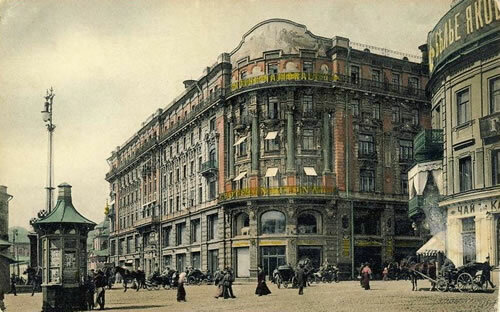 The Hotel National, where the Rebbe Rashab stayed during the October Revolution, as photographed in 1903. 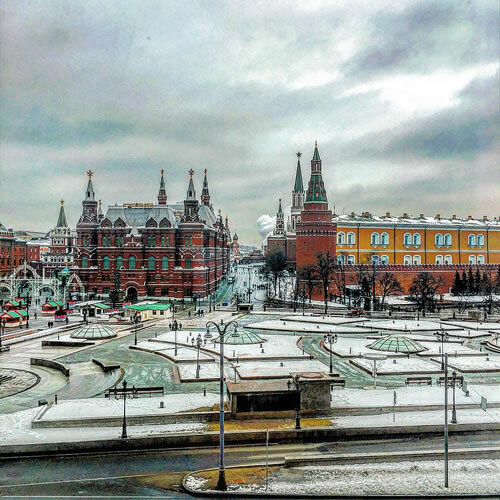 View from the Hotel National, where the Rebbe stayed during the October Revolution, across Manezhnaya Square. The Kremlin is on the right and the State Historical Museum is on the left. On returning to Rostov the Rebbe acquired a printing press and published prayer books according to both the regular Ashkenazi liturgy and the Arizal liturgy favored by Chassidim. The press imprint was Defus Ezra and the prayer book was titled Siddur Tehillat Hashem.39 These prayer books were reprinted several times during the early years of the Soviet regime and the standard Chabad prayer books in use today continue to bear that title. Rabbi Menachem Mendel Schneerson, Reshimot Ha-yoman, 421. Regarding the deliberations at the conference in 1910 and the Rebbe’s meeting with Stolypin, see Yehoshua Mondshine, “Asifat ha-Rabanim be-Russia bi-Shenat 1910”, Kfar Chabad Magazine, no. 898 et seq..; Shalom DovBer Levin, Toldot Chabad be-Russia ha-Tzarit (Kehot Publication Society, 2010), 296–301; Ilia Lurie, Lubavitch and its Wars: Chabad Hasidism and the Fight for the Image of the Jewish Society in Czarist Russia (Ph.D. thesis, Hebrew University, 2009), chapter 5.4. The term “Schneersohnovschina” was used by Anatol Lunatcharsky, Soviet Commissar of Education, as quoted in a JTA report from 1928, Soviet Education Commissar Advises Jews to Fuse in Russian Melting Pot. On Chabad activities during the early years of the Soviet regime see David Fishman, “Preserving Tradition in the Land of Revolution: The Religious Leadership of Soviet Jewry, 1917-1930,” in Jack Wertheimer (Ed. ), The Uses of Tradition (New York: Jewish Theological Seminary of America, 1992), 85-118. Rabbi Yosef Yitzchak Schneersohn, Sefer Ha-sichot 5680, 1. See further sources cited there. In several private letters written during the course of the war the Rebbe Rashab wrote of the need to “vanquish, throw to the dust and expel”. . . “our enemies, the cursed Germans” with particular vehemence. See, for example, Rabbi Shalom DovBer Schneersohn, Igrot Kodesh Vol. 2, 809 (#454). Rabbi Shalom DovBer Schneersohn, Sefer Ha-sichot - Torat Shalom, 202. Shalom DovBer Levine, Me-beis ha-genazim, 24-26. Rabbi Shalom DovBer Schneersohn, Sefer Ha-sichot - Torat Shalom, 202. For more musings on the national and spiritual power vested in the monarch, and in the Tsar in particular, see Levine, Me-beis ha-genazim, 29. Rabbi Shalom DovBer Schneersohn, Sefer Ha-sichot - Torat Shalom, 203. See David Engel "World War I," in YIVO Encyclopedia of Jews in Eastern Europe. Rabbi Shalom DovBer Schneersohn, Igrot Kodesh Vol. 2, 796 (#439). On the Pale of Settlement and its history, see John Klier, "Pale of Settlement" in YIVO Encyclopedia of Jews in Eastern Europe. On the Rebbe Rashab’s involvement in efforts to relieve the restrictions, see Shalom DovBer Levine, Toldot Chabad Berussia Ha-tsarit, 277-284. Rabbi Shalom DovBer Schneersohn, Igrot Kodesh Vol. 2, 802 and 806 (#445 and #450). See also Eli Rubin, The Chinese Matzah Campaign of 1905. See Shalom DovBer Levine, Toldot Chabad Berussia Ha-tsarit, 304-305; Andrew Koss, “War Within, War Without: Russian Refugee Rabbis during World War I,” in AJS Review 34:2 (November 2010), 231-263. Rabbi Yosef Yitzchak Schneersohn, Sefer Ha-sichot 5702, 16. Yehudah Chitrik, Reshimot Devarim (2009 Edition), 179. See the personal journal of Rabbi Yosef yitzchak Schneersohn, published in Levine, Me-beis ha-genazim, 29-31. For more about Hemshekh Besha’ah Shehekdimu 5672, also known simly as “Ayin Bet,” see Eli Rubin, The Ayin Bet Discourses One Hundred Years On. See also Elliot R. Wolfson, “Nequddat ha-Reshimu—The Trace of Transcendence and the Transcendence of the Trace: The Paradox of Ṣimṣum in the RaShaB’s Hemshekh Ayin-Beit,” Kabbalah 30 (2013), 75–112. See Shalom DovBer Levine (Ed. ), Lubavitch (Agudat Chassidei Chabad Be-medinat Chever Ha-amim, 2001). See Rabbi Shalom DovBer Schneersohn, Igrot Kodesh Vol. 5, 99 (#1’61) and 103 (#1’64). For an overview of how the First World War exacerbated existing tensions and brought Russia over the precipice of revolution, see Rex A. Wade, The Russian Revolution, 1917 (Cambridge: Cambridge University Press, 2008), 17-28. Rabbi Shalom DovBer Schneersohn, Igrot Kodesh Vol. 5, 106 (#1’65). Regarding the Tsar’s abdication and the Rebbe’s return to Rostov see below, n. 27. Rabbi Shalom DovBer Schneersohn, Sefer Ha-maamarim 5677, 133-134. For an overview of the unfolding of the February Revolution in Petrograd, see Wade, The Russian Revolution, 29-52. Rabbi Yosef Yitzchak Schneersohn, Sefer Ha-sichot 5703, 94-95. Rabbi Shalom DovBer Schneersohn, Igrot Kodesh Vol. 2, 829-831 (#466) and 834-837 (#469). For an overview of the Rebbe Rashab’s efforts in this arena, as reflected in the extant correspondence, see Shalom DovBer Levine, “Introduction” in Rabbi Shalom DovBer Schneersohn, Igrot Kodesh Vol. 5, 17-20. See Rabbi Shalom DovBer Schneersohn, Igrot Kodesh Vol. 2, 875-877 (#495 and #496). On the breakdown of government control during this priod, see Wade, The Russian Revolution, 215-223. Rabbi Shalom DovBer Schneersohn, Igrot Kodesh Vol. 2, 877 (#496). Idem., Igrot Kodesh Vol. 5, 128 (#1’77). See also the letter to Rabbi Chaim Ozer Grodzinski, Idem., Igrot Kodesh Vol. 2, 885 (#500). Wade, The Russian Revolution, 241, 244 (events in Petrograd), and 253-254 (events in Moscow). 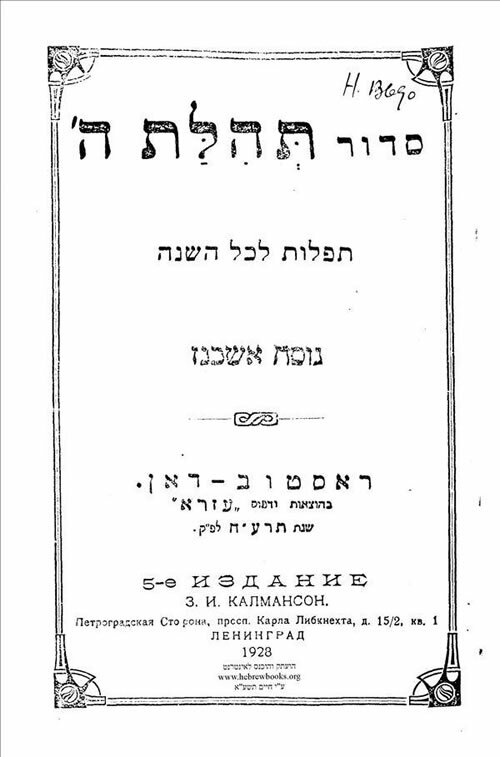 Rephael Nachman Kahn, Shemuot Ve-sipurim Vol. 1 (First Edition, Kfar Chabad, 1964), 103. Some details, including the name of the hotel, do not appear in later editions. Rabbi Shalom DovBer Schneersohn, Igrot Kodesh Vol. 2, 878 (#497). See Idem., Igrot Kodesh Vol. 5, 126 (#1’75), 144 (#1’87) and other relevant sources cited by the editor there. For an example of the devastating impact of revolution and civil war on Jewish communities in Russia, see Eli Rubin, Strength in the Soviet Shadow: The Life and Writings of Rabbi Levi Yitzchak Schneerson—Part Two. DovBer Rivkin, Ashkavta De-rebbi (New York: Balshon Printing Co., 1976), 8. Another fine history, geography and vocabulary lesson! And a chance to learn more about the bravery of our Rebbes.